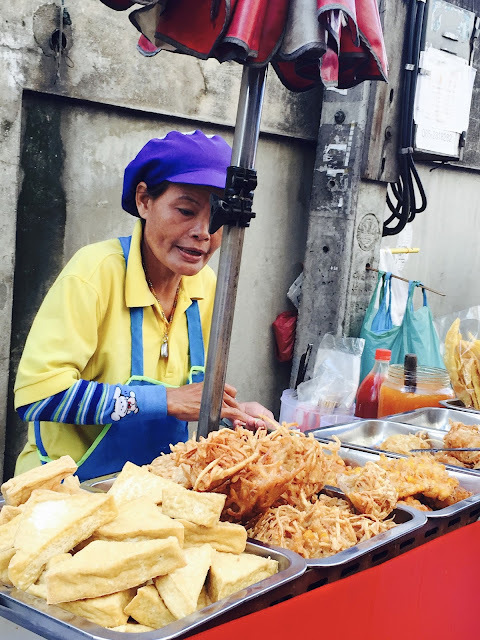 It was only during our last day in Bangkok that I really got to explore and mingle with the locals. Prior to exploring Ratchathewi, I was with the Team Bangkok of Air Asia / Nikon Travel Photographer 2015. 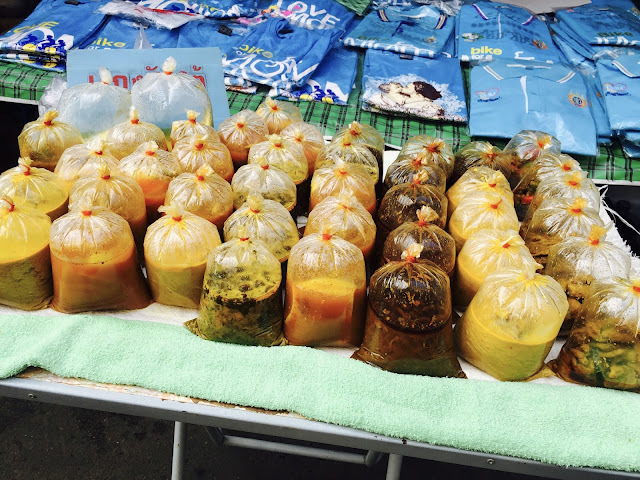 Bangkok is known as a shopping mecca, and a land of temples but I know there's more. 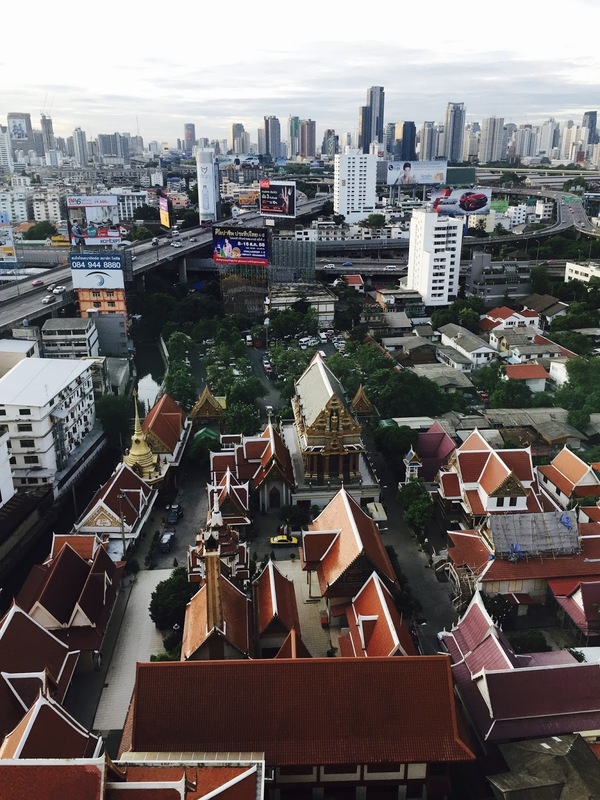 I can see these temples from my room at Century Park Hotel Bangkok. These were among the first things I saw upon waking up on my first morning in Bangkok. 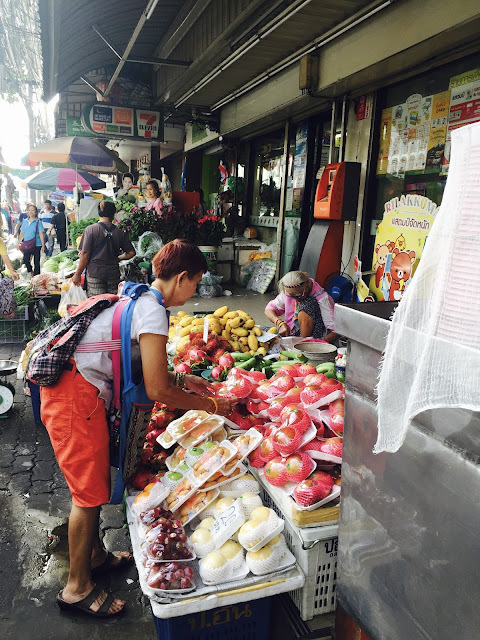 I wasn't able to explore Bangkok until our last day when we were given "free" time to do some shopping. So I excitedly woke up early and left the hotel sans breakfast. I really didn't know what to expect since I only wanted to visit the temples. After asking the hotel staff for directions (luckily, I have a built-in navigation system), I set off to explore the neighborhood. I was quite surprised to discover a weekend market (it was Saturday) when all I am expecting to find are temples and monks. 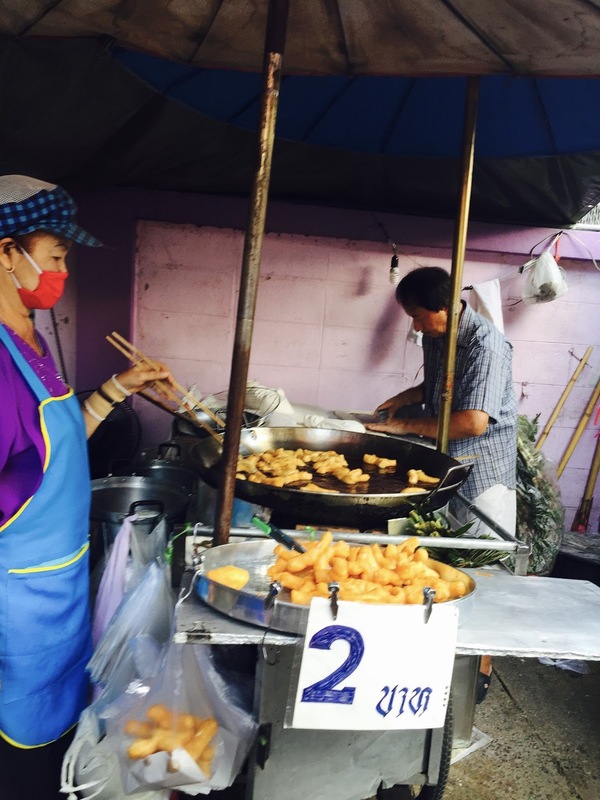 This lady here is selling some fried tofu and vegetable fritters. Having a conversation with the locals is quite hard since most of them doesn't speak English. Here's a fruit seller. There's tons of apples, pears, dragon fruits, limes, etc. Here's another seller frying dough which she sprinkles with sugar. I think we have this in the Philippines, too. 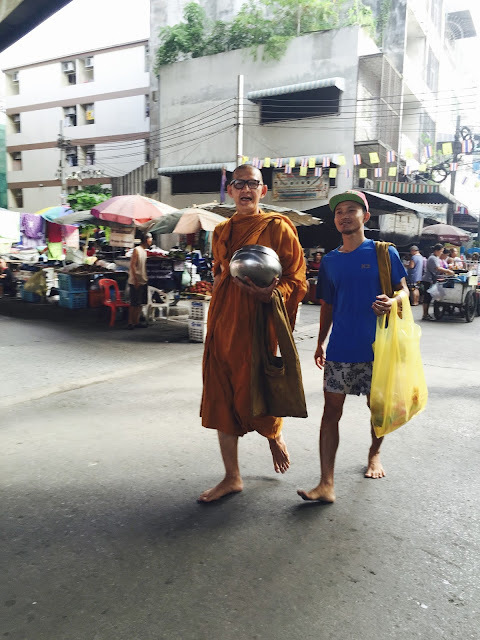 Here is my first monk sighting in Ratchathewi District. 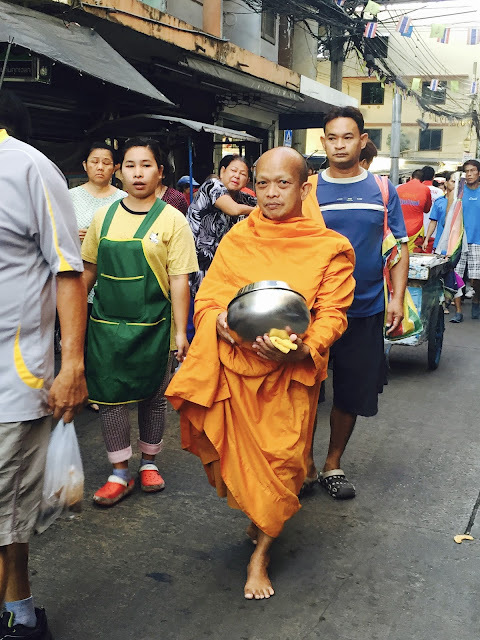 Time was around 630am and I read somewhere that monks walk the streets early in the morning with their food bowls. 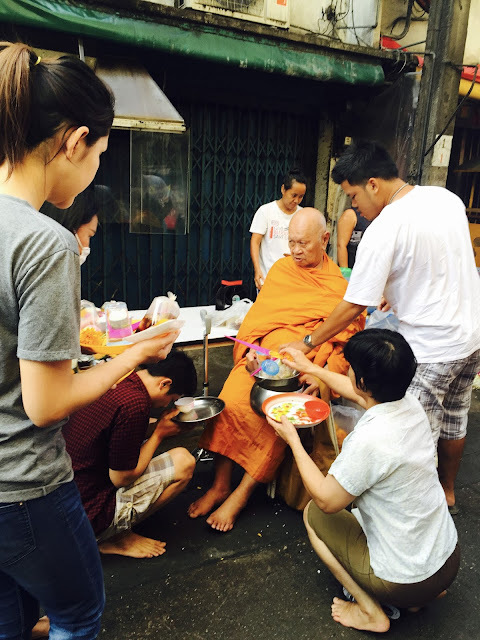 Saw an old monk and there are people around him asking for blessings. They are offering him food which they place on his food bowl. One can buy fruits or simply give any food to the monks. 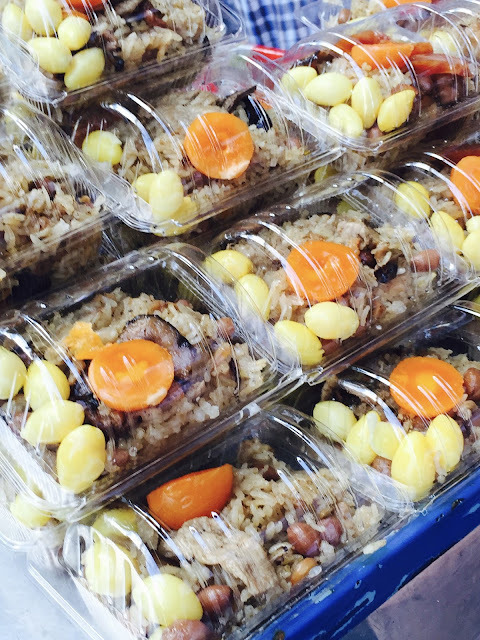 But here's a popular offering --- I guess it is like a complete food already since it has rice, vegetables, and fruit. It was also my first time to see a female monk so I am not sure if female monks wear white instead of orange. 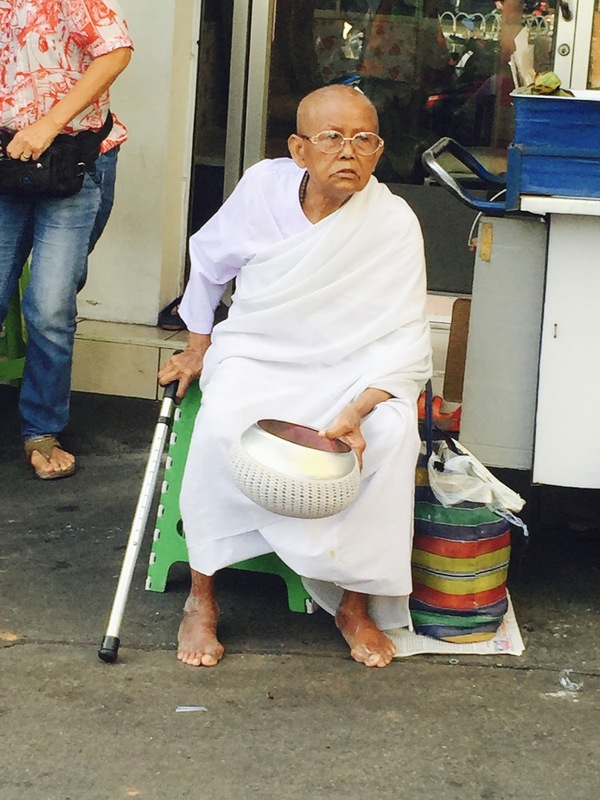 I bought some food for this female monk and she touched my head and recited some blessings or prayers, maybe. Actually, most people give food or ask blessings from the male monks that's why I approached this female monk. And here's another monk with a huge bowl and a companion. I think the yellow bag has food already. Bought some pandan-flavored fried rice dough from this lady. I even brought some back to Manila. It tasted a bit sweet. 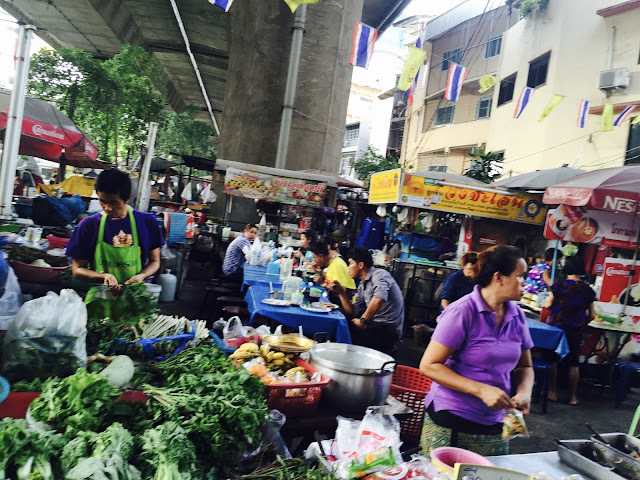 Aside from food and fruit sellers, there's also a stall that sells manga (in Thai). I think I bought 2 for my daughter for picture reading. Mangas here costs less than P100. Wow! 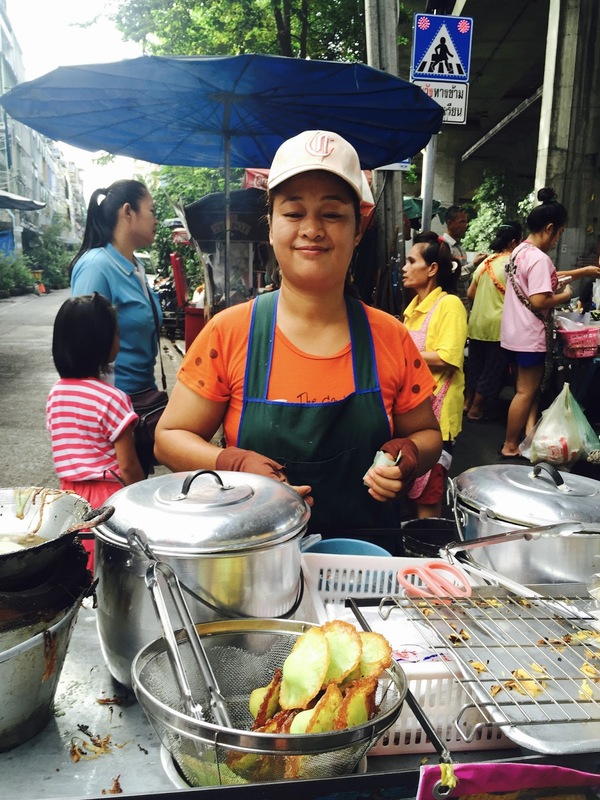 There are vegetable, meat, and fish sellers, too. This scene from under the skyway and just beside the railway greatly reminds me of home. The scene is all too familiar except that there's no jeepneys and the language around me is different. 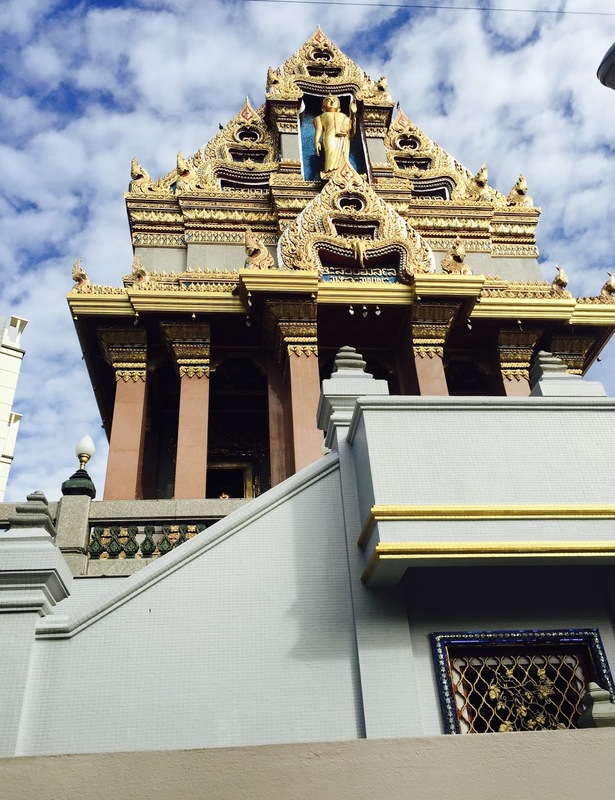 At last I got to see the temple that I saw from my hotel window and it was amazing. The compound of temples here modernly-built as compared to the ones in the Grand Palace. 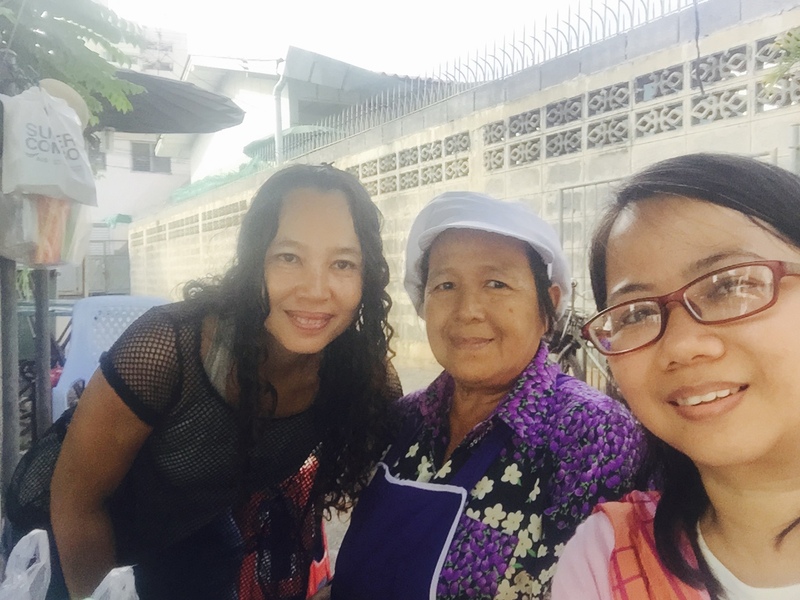 Then I got thirsty and bought a glass of chocolate drink (Ovaltine, I think) from the lady seller (the one in black). The one in purple has a food stall nearby or maybe they are related. Glad that they gamely posed for a photo with me. 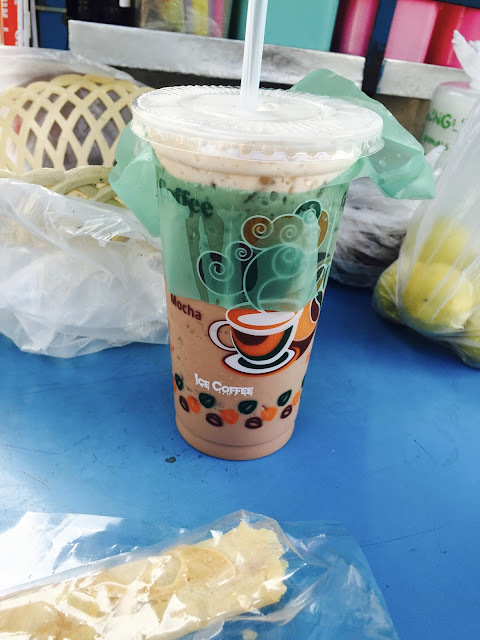 This is what I bought, a very cold chocolate drink that costs 1-2 baht if I'm not mistaken.